The lighter weight your sunglasses are, the longer you can wear them comfortably—so you can spend extra time at the beach, on the trail, or wandering your favorite city without squinting against the sun. Reduce wearability issues like pinching, headaches, and dents on your nose or behind the ears with a great-fitting pair of sunglasses. When looking for lightweight, comfortable sunglasses, consider the lens and frame materials they’re made from, as well as the shape and size of the frames you pick. The larger the sunglasses frame, the heavier it is—and heavy frames can result in slipping or discomfort. Minimal slippage is important for runners, bikers, and other athletes—frames with extra-grippy materials on the arms or bridge can keep sunglasses where they belong for added comfort. There is no shortage of options for fashion or driving sunglasses, but materials that won’t bend or warp through use or exposure to high temperatures are ideal for comfort and durability. Whatever you need your sunglasses for, a lightweight style keeps you from pushing them back in place throughout the day. Choose the frame material and style that best suits your favorite activities. A common option is a plastic or plastic blend, including acetate, propionate, and eco-friendly materials made from castor oil. Nylon is a lightweight material that offers durability but doesn’t lack flexibility so they’re often impact-resistant and won’t break easily. Metal frames are lightweight—but are likely to bend and flex so they are better suited for fashion or driving, rather than sports. Metal frames are more easily adjusted for comfort and fit than other materials. Lighten up a pair of sunglasses for more comfortable wear with rimless or semi-rimless frame styles. The less frame material, the lighter they are. Rimless sunglasses styles may have some drawbacks when it comes to compatible prescription lenses—higher prescriptions mean thicker lenses that may not fit in the frame—but are otherwise a lightweight option that can follow you through your favorite activities. Sunglasses lenses can be made from a number of materials, all with their own pros and cons. Polycarbonate and plastic are the most common types, glass is also an option. Polycarbonate lenses are impact-resistant and are often used for sports and in safety glasses. They’re durable, lightweight, and UV-protective. If you’re a fan of rimless sunglasses, a polycarbonate lens is a perfect material to stand up to everyday wear and tear or an active lifestyle. 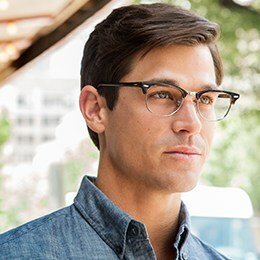 Glass lenses offer the best clarity and more scratch resistance than other lens types. But, they are heavier than polycarbonate lenses and may shatter if dropped or while playing sports. Hi-index lenses may be used for prescription sunglasses and may reduce weight in strong prescriptions, but they are not suitable for all uses. Polycarbonate lenses beat them out in terms of safety for activities like sports and shooting. The two most common types of sunglasses hinges are standard and spring, or flex, hinges. Sporty sunglasses tend to have flex hinges—the snug fit offered by spring hinges keeps sunglasses in place, making them an ideal choice for athletics. With additional options to increase grip, lightweight sporty frames with spring hinges resist slipping even in wet or sweaty conditions. Flex hinges aren’t limited to sports sunglasses, and they can offer an improved eyewear fit. The less your eyes have to strain against sunny conditions and glare, the more comfortable you will be. UV protection is always a must. Glare while driving or on the water can cause headaches or sore eyes—give polarized lenses a try to cut glare. Specific sunglasses lens tints make your favorite activities easier by enhancing contrast, reducing glare, and offering suitable light reduction. Photochromic sunglasses lenses provide a just-right tint that adjusts to the light conditions. Choosing the most comfortable sunglasses comes down to lightweight frame materials, lenses suited to your activity and a great-fitting style that grips in all the right places. Protect your eyes by choosing impact-resistant materials such as polycarbonate lenses for sports and active lifestyles, and select the lens tint and lightweight frame style that will offer the most comfort for your favorite activities. The result will be a comfortable pair of sunglasses you can wear all day long.